The anterior divisions of the thoracic spinal nerves (T1–T11) are called the intercostal nerves. The intercostal nerves are part of the somatic nervous system. This enables them to control the contraction of muscles, as well as provide specific sensory information regarding the skin and parietal pleura. Intercostal nerves connect to the appropriate ganglion in the sympathetic trunk through rami communicantes and serve the thoracic pleura and the abdominal peritoneum. Unlike most other anterior divisions of spinal nerves, the intercostal nerves do not form a plexus. thoracic spinal nerves: The spinal nerves emerging from the thoracic vertebrae. Branches also exit the spine and go directly to the sympathetic chain ganglia of the autonomic nervous system where they are involved in the functions of organs and glands in the head, neck, thorax, and abdomen. sympathetic trunk: Also called the sympathetic chain or gangliated cord, these are a paired bundle of nerve fibers that run from the base of the skull to the coccyx. abdominal peritoneum: The serous membrane that forms the lining of the abdominal cavity. It covers most of the intra-abdominal organs. It is composed of a layer of mesothelium supported by a thin layer of connective tissue. The peritoneum supports the abdominal organs and serves as a conduit for their blood and lymph vessels and nerves. The intercostal nerves are part of the somatic nervous system and arise from anterior divisions (rami anteriores, ventral divisions) of the thoracic spinal nerves T1 to T11. The intercostal nerves are distributed chiefly to the thoracic pleura and abdominal peritoneum. Intercostal nerves: An image of the intercostal brachial nerves. They differ from the anterior divisions of the other spinal nerves in that each pursues an independent course without plexus formation. The larger branch leaves the thorax in front of the neck of the first rib and enters the brachial plexus. The other smaller branch, the first intercostal nerve, runs along the first intercostal space and ends on the front of the chest as the first anterior cutaneous branch of the thorax. These are limited in their distribution to the parietes (wall) of the thorax. The anterior divisions of the second, third, fourth, fifth, and sixth thoracic nerves, and the small branch from the first thoracic, are confined to the walls of the thorax and are named thoracic intercostal nerves. Near the sternum, they cross in front of the internal mammary artery and transversus thoracis muscle, pierce the intercostales interni, the anterior intercostal membranes, and pectoralis major, and supply the integument of the front of the thorax and over the mamma, forming the anterior cutaneous branches of the thorax. The branch from the second nerve unites with the anterior supraclavicular nerves of the cervical plexus. The seventh intercostal nerve terminates at the xyphoid process, at the lower end of the sternum. The anterior divisions of the seventh, eighth, ninth, tenth, and eleventh thoracic intercostal nerves are continued anteriorly from the intercostal spaces into the abdominal wall; hence they are named thoraco-abdominal nerves or thoracicoabdominal intercostal nerves. The tenth intercostal nerve terminates at the umbilicus. 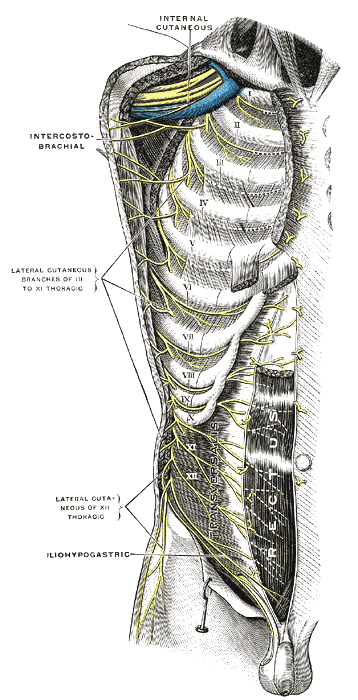 The twelfth (subcostal) thoracic nerve is distributed to the abdominal wall and groin. Unlike the nerves from the autonomic nervous system that innervate the visceral pleura of the thoracic cavity, the intercostal nerves arise from the somatic nervous system. This enables them to control the contraction of muscles, as well as provide specific sensory information regarding the skin and parietal pleura. This explains why damage to the internal wall of the thoracic cavity can be felt as a sharp pain localized in the injured region. Damage to the visceral pleura is experienced as an unlocalized ache.